Moist and chewy, our colossal cookie cakes are made with real butter, whole eggs, and pure vanilla. Eat your cookie cake with a fork or fingers. On plates, napkins, or right out of the box. 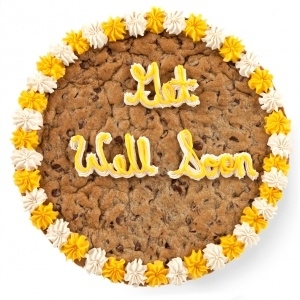 Anyway you slice it, our Big Cookie Cakes are still first in flavor. **Due to our dough mixing process, all of our products may have come in contact with nut oils. Etched Merlot Wine Bottle Mug Gift Set With Your Logo Drawstring Backpack with Your Logo Burst of Flavor Balsamic Vinegar 6 Pack ***SAVE 10% & Free Shipping!!! ***- Select your 6 and enjoy!